Thought I would share my version of the 'Chao Wall'. It is still under construction, but I have made some good progress. Will post other pictures as the project continues. Since it's not complete, would appreciate any ideas/feedback. What slides are you using? Thanks for the nice comments. I got the pulls on the systainer trays painted green today- it is supposed to be the Festool green (first applied looks to be a nice match) but it is drying a little dark. Oh well, close enough for me. Also painted the desk top that will go below the window, as well as the top for my Kapex station. Now I just need to find the right Blum hinges/plates for the doors. @Cheese, the glides are a 16" full extension from CS Hardware. Part number is 39.1170.16. Jealous as can be. Perhaps one day I can copy yours. Very nice. Wish I had room to go back to using single depth. One day. That is fantastic! Everything so neat and in place. I will not show this to my better half because it will get me in trouble! It was a pleasure talking with the both of you at Connect. Glad to see you made it back home safe! Chaos wall---because order comes from chaos? I had to do something about my mess. Looks great, Tom! Like the double depth pull-outs for the Systainers. Plenty of storage! Nice...love the double depth on the Systainers. That’s pretty much a no brainer if you think about it. Pretty much a no brainer even if you don’t think about it. Very nice Tom. Got any other pics you'd care to share? Had some time over the Christmas break to make doors for my chaos wall as well as add another section on the left side of the window. I mounted a small desk-top in between them underneath the window and will be adding some storage underneath the top in the future. 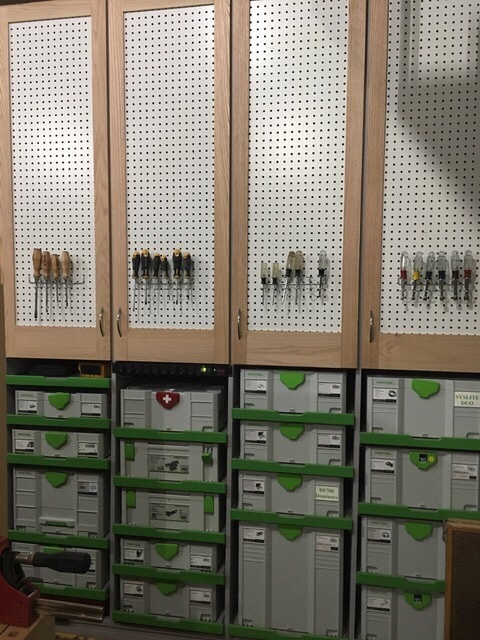 I used pegboard for the door panels- thought it would be nice to have screwdrivers and other frequently used tools hanging up since my workbench sits only a few feet away. 'Borrowed' the idea from @Timtool and hope it's a better solution than having them in a tool chest. Still have some drawers/drawer fronts to make before this is completed- also need to paint the door frames. I'm torn between painting the door frames grey like the end panels or green to match the tray pulls- what do you think? Those look great with the pegboard doors. I’d personally paint them grey! I used pegboard for the door panels- thought it would be nice to have screwdrivers and other frequently used tools hanging up since my workbench sits only a few feet away. 'Borrowed' the idea from @Timtool and hope it's a better solution than having them in a tool chest. Yes - that was such a good idea from Timtool. I am thinking of doing the same. If you're into borrowing ideas, did you see the box storage in the recent Transportable System thread? I really like how there are the pull out shelves (just like for the systainers), but the box can be removed for easy access and swapping around, and it retains the same type of "shelf-pull" look. - also need to paint the door frames. I'm torn between painting the door frames grey like the end panels or green to match the tray pulls- what do you think? I think green door frames might be overkill, and either gray or leaving natural looks nicer. If you incorporated that idea about the drawer boxes on pull out shelves you could even paint the boxes grey, and the shelf pulls green. Looking forward to seeing pictures of the next developments. If you're into borrowing ideas, did you see the box storage in the recent Transportable System thread? I relly like how there are the pull out shelves (just like for the systainers), but the box can be removed for easy access and swapping around, and it retains the same type of "shelf-pull" look. I actually have considered that- there are a lot of great ideas in that short video. After watching that, my thought was to make the trays and then make the removable drawers similar size to systainers (1, 2, 3) so that I can change the organization as my needs change. @tjbnwi, I like your pull-out board idea- I'm going to incorporate something similar into my MFT cart that I'm in the process of making. You'll love the pegboard. Easy to organize and so easy to just grab the right tool. All of my frequently used items are on pegboard or racks. Screwdrivers, hammers, calipers, wrenches, pliers, wire strippers all just a reach away. After moving around from one place to another I think we are finally settling down in San Diego, and I will be gathering the remnants of my Festool family along with distant relatives into the house we are buying which has the feature I wanted most--a three-car garage! The inspection is today, I had trouble sleeping, so woke up at 4 and went to FOG to look for garage workshop plans. By now I have seen all the Guido Henn Festool Theorie (com'on guys, Chaos is what he went FROM and am hooked. Glad to see your version, Gerald D.
Does anyone know if there are written plans for Henn's Festool Theorie cabinet system? In German is fine. It's been over 50 years since I was a student in Berlin, but thanks to God's gift of memory and a wonderful tutor, Wolfgang, I can still get by. Barring that, links to the hardware used would be great. I did see a link to some drawer slides, but I'm wondering about those specialized double-sided Euro screws that allow you to connect everything together. Guido built his units mostly in cabinet plywood, others have done theirs in laminate. Any thoughts for those of you who have done one or the other? Lumberjocks fancy version of "Chaos Wall"
I'm mostly retired now, and looking forward to finally having a decent- looking and -functioning shop in a reasonable space. Thank you all for the experience you provide instantly and generously to a fellow Festool junkie. I'm just now seeing this thread and I know it's a little late , but nice work you've done. I also am on a cleaning and organizing spree. Just like our old rule on the jobsite "never go back to the truck empty-handed", I tell myself "you're not leaving the shop without having something to sell, give away, or put in the trash ! " So far, it's working ! Thanks- still building and organizing (just finished another sortainer cabinet last weekend). I hope to post some more pictures once I get a little farther on my customer orders. I figured you were doing some 'housecleaning' in the workshop with your postings in the classifieds area. I found several tools as well that don't get much use so I'll be posting some various things in the near future. I see this picture and I’m reminded of WOW.